Cooking with Julia & Dan – a 'peace' of my mind…. 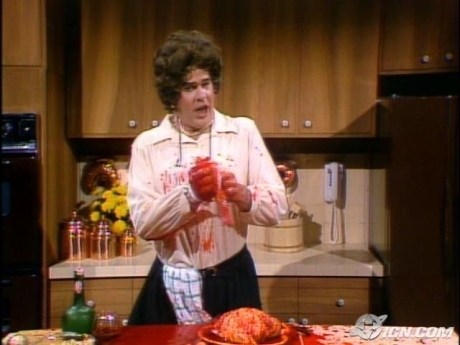 The Saturday Night Live sketch with Dan Akroyd mimicking Julia Child is one of my all time favorites. You know, the sketch where Julia gets a little tipsy from drinking the cooking sherry and ends up gashing her finger with a knife. By the end of the scene she’s lost so much blood that she’s hallucinating, but trying to remain calm on the air. We recreated that sketch a million times when I was in high school. I guess it was funny because we’d all grown up watching Julia Child’s cooking show on PBS on Saturday afternoons. Right before Lawrence Welk. Before the days of cable television. When your parents are old and you only got three channels plus PBS, you watched things like Julia Child and Lawrence Welk. After seeing that sketch when I was in high school, my friend who lived across the street and I used to love to imitate Julia in the kitchen. Really we were imitating Dan Akroyd imitating Julia Child. “First of all,” we’d start out, just like Dan Akroyd did, and then add commentary to everything we were fixing in the kitchen. Sometimes we baked cookies or a cake in her kitchen, sometimes we went back to my house. We did that so much that when she married, I gave her a Julia Child cookbook. She and her husband and daughter live in another city now, but she’s coming over to my house later this morning to catch up while she’s in town. We’ll make coffee and bake some blueberry muffins and at some point one of us will start. Or my personal favorite, “I’m remembering a time….” – the line Akroyd uttered just as Julia was slipping out of consciousness from the loss of blood! Then we’ll laugh at ourselves like we did when we were 16. Don’t you wish you could be in my kitchen right about now? !